SkyDrive.exe is dead. Long live OneDrive.exe. 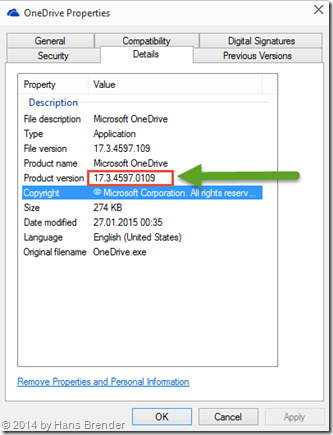 OneDrive now is really OneDrive. The old SkyDrive.exe will be eliminated. The new one is now OneDrive.exe. Microsoft concludes the Rebranding. 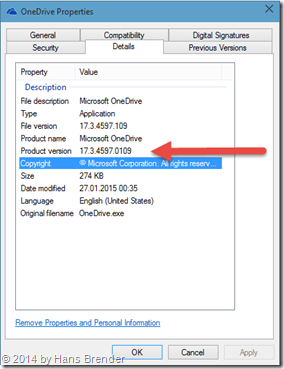 You will find the new OneDrive.exe in Windows 10 Build 9926 (Technical Preview). You still work with Windows Vista, Windows 7 or Windows 8? You have to wait a little bit. Microsoft rolled out the windows version, but they do it in steps. You should consider about the installation basis of more than 250 Million OneDrive users in the world. Although the MacOS have to wait until the Apple store process is finished. The folder 17.3.4597.109 is equal to the product version und and holds all installation files and resource files for all languages. 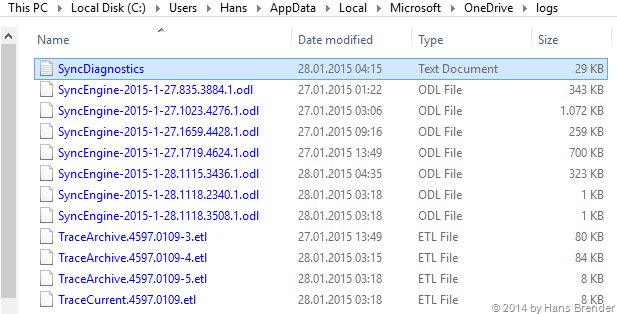 In the folder logs you will find all log-files for the sync process. All local settings are saved in the folder Settings. The folder Setup contains one subfolder logs and there are all installation logs, also the change from SkyDrive to OneDrive. If have updated to Windows 10 Technical Preview Build 9926, there is an automatic change form SkyDrive to OneDrive. But you have to know: Windows 10 is a Technical Preview a Technical Preview a Technical Preview. You may have attention to productive data! I will deal with the log Installation and configuration files, and write about a separate blog post. SkyDrive.exe ist tot. 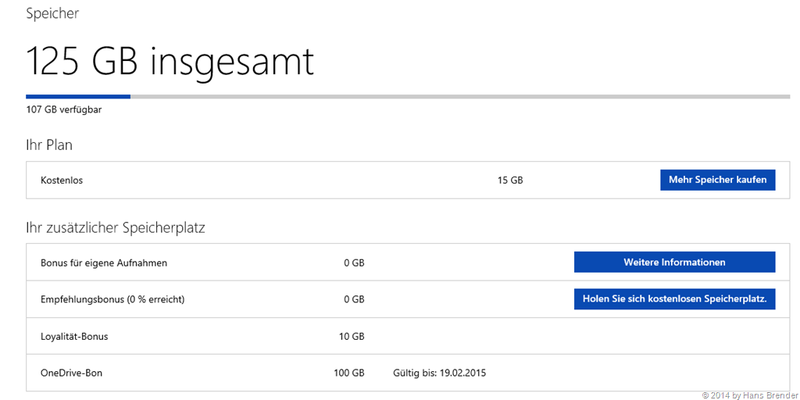 Lang lebe OneDrive.exe. 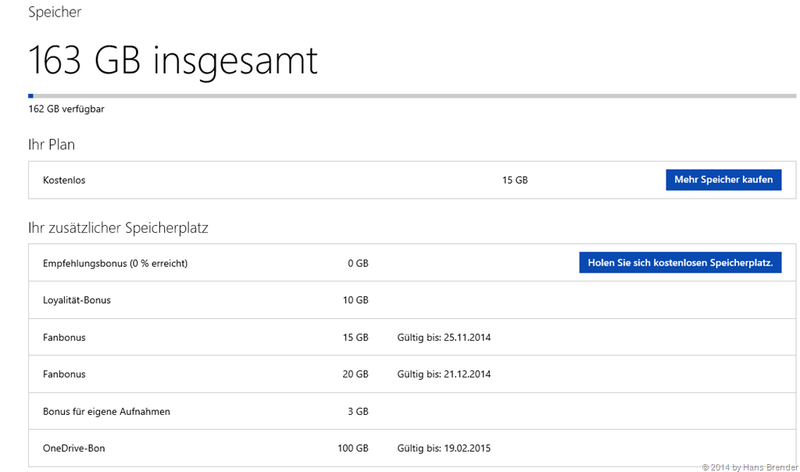 OneDrive ist jetzt wirklich OneDrive. Die ehemalige SkyDrive.exe ist jetzt OneDrive.exe. Damit ist das Rebranding wohl abgeschlossen. Die OneDrive.exe ist Bestandteil von Windows 10. Zumindest ist Sie im Build 9926 der Windows 10 Technical Preview zu finden. Sie arbeiten noch mit Windows Vista, Windows 7, oder Windows 8? Auch die MacOS Benutzer müssen sich warten,bis das Procedere im Apple Store durch ist. Der Ordner 17.3.4597.109 entspricht der (derzeitigen) Produktversion und enthält die kompletten Installationsdateien und die abhängigen Ressourcen in mehreren Sprachen. Im Ordner Settings werden die lokalen Einstellungen gespeichert. Der Ordner Setup bzw. eine Ebene tiefer logs enthält die Installations-Logs, so auch die Umwandlung von SkyDrive zu OneDrive. Wer ein Update auf Windows 10 Technical Preview Build 9926 gestartet hat, muss sich keine Sorgen um die Umstellung machen. Die wird nämlich automatisch vorgenommen. Trotzdem sollten Sie immer daran denken: Windows 10 ist eine Technical Preview eine Technical Preview eine Technical Preview. Also Vorsicht mit produktiven Daten! 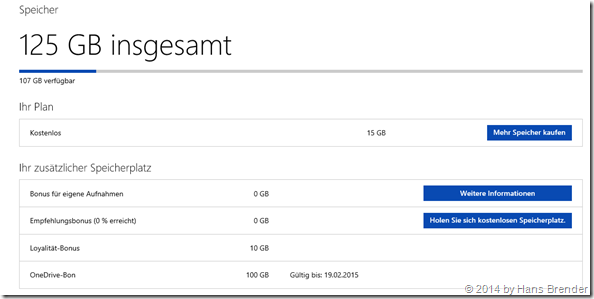 Aus SkyDrive wird OneDrive: Die Umstellung hat begonnen. Ich werde mich mit den Log- Installations- und Konfigurationsdateien beschäftigen und darüber getrennt einen Blog Post schreiben. Microsoft has announced that all users OneDrive additional memory can be obtained. I have described here and here. And now it’s done. 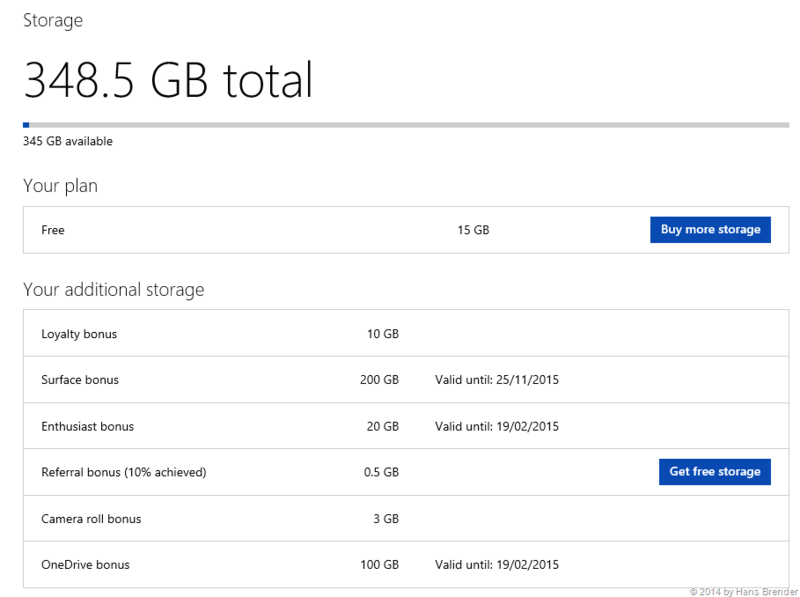 All OneDrive users get 8 GB of additional storage. Thus, each user has 15 GB of free disk storage available. Therefore Microsoft has released 10 petabyte storage in the cloud available. Thanks to my MVP colleague Günter Born for the tip. 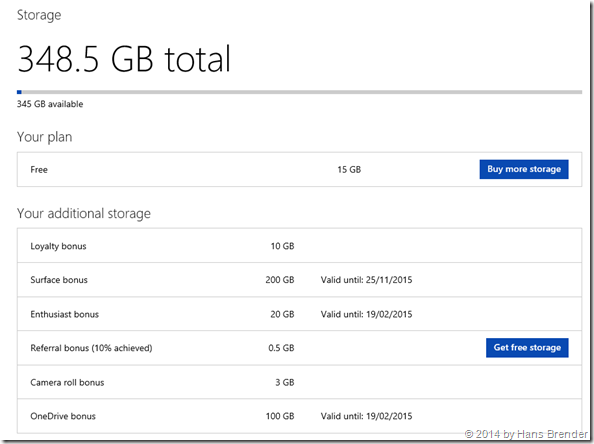 or you choose Office 365 Home with 1 TB storage for 10$ each month. 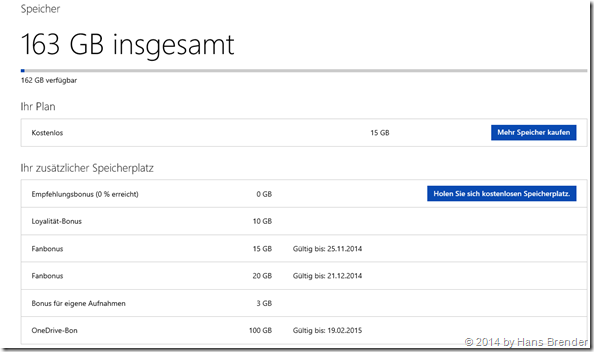 Customers, who have already registered OneDrive before 04/12/2012, the product was called SkyDrive, got 25 GB of storage. This was reduced in the past to 7 GB, unless you clicked before August 2012 at a special link. Then they kept the 25 GB. All of these customers will keep the memory of 25 GB, which is, however, now divided. And when you press here, you will see, how much storage do you have with OneDrive.